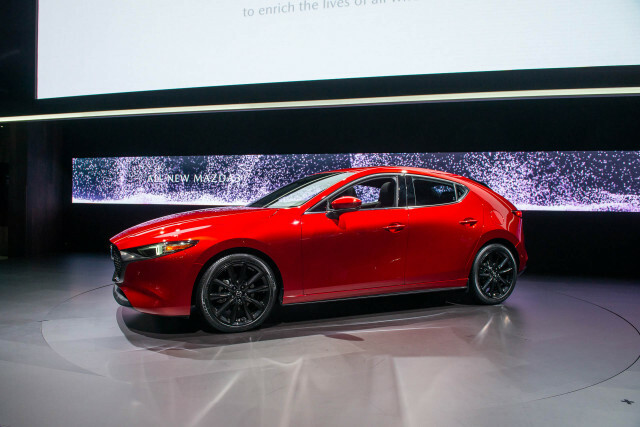 An evolutionary redesign that bowed Wednesday at the 2018 LA Auto Show puts the 2019 Mazda 3 in line with the automaker's larger sedan and its crossover SUVs. Bigger changes come inside and behind the scenes, where the Mazda 3 ushers in a new fuel-saving, high-compression engine, a larger infotainment screen, an available infrared driver-monitoring system, and a host of changes designed to make the small sedan and hatchback quieter on the highway. Additionally, the new Mazda 3 will be available with all-wheel drive for the first time. At first glance, the new Mazda 3's styling doesn't stray far from the outgoing model—at least as far as the sedan is concerned. That model's taut proportions carry over, albeit with a cleaner front end design and a thin ribbon of taillights with a circular LED design. 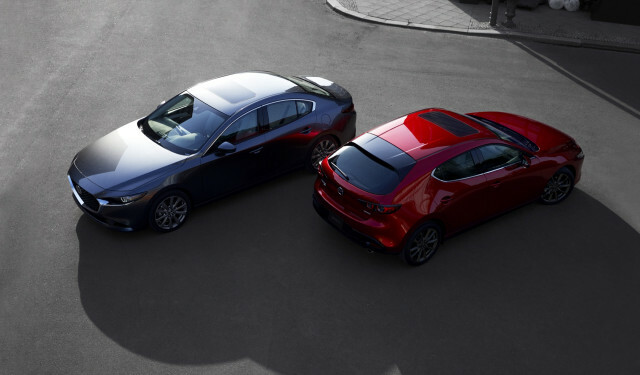 The new Mazda 3 hatchback's styling is more dramatic, with a massive rearmost roof pillar that gives it considerable visual heft compared to a more delicate look on the outgoing model. 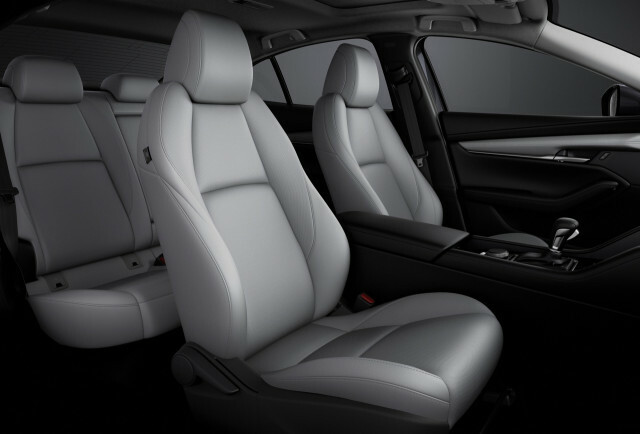 Inside, the 3's interior appears to be a 7/8ths version of what's in the Mazda 6 mid-size sedan. The dashboard is low, with an 8.8-inch widescreen display nested in a crevice above the center console. Secondary switches are sparse, with a handful surrounding the gear lever and climate controls grouped in the center of the dashboard. A newly available driver-attention monitoring system uses infrared to watch the driver and to sound an alert if it detects wandering eyes looking away from the road. Mazda hasn't detailed the 2019 3's U.S.-market specifications, but it did say that an 8-speaker audio system will be standard equipment and Bose-branded speakers are on the options list. Mazda didn't immediately say if the new 3 will have Apple CarPlay and Android Auto compatibility. The brand has been rolling out compatibility with smartphones over the last few months for its current and older models. On the safety front, the 2019 Mazda 3's infrared driver-attention monitoring system works in conjunction with the automatic emergency braking system to alert drivers in a dangerous situation. The available adaptive cruise control system is more advanced than before and can automatically handle steering inputs in certain high-traffic situations. 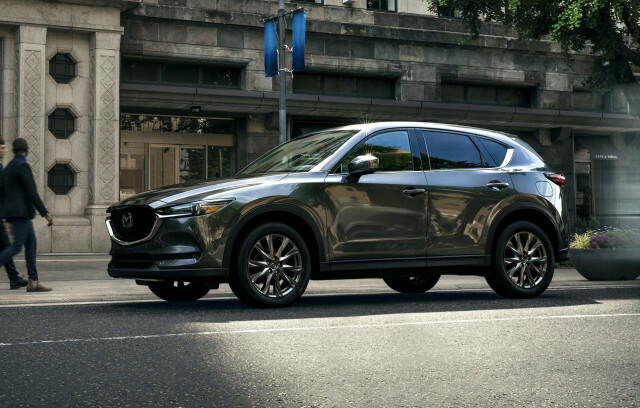 Mazda said that automatic emergency braking will be standard and that the 3 will offer forward cross-traffic alerts to help out in intersections with low visibility. A knee airbag for the driver is now included on the 3, bringing the airbag count for the small car to seven. Under the Mazda 3's hood, three inline-4 engines will be on offer globally. Specifications for the U.S. market haven't been released, but Mazda said that 2.0- and 2.5-liter inline-4 engines will be mated to either 6-speed automatic or 6-speed manual transmissions. Last year's Mazda 3's 2.0- and 2.5-liter inline-4 engines were rated at 155 and 184 horsepower, respectively, figures that provide a basis for the new model. 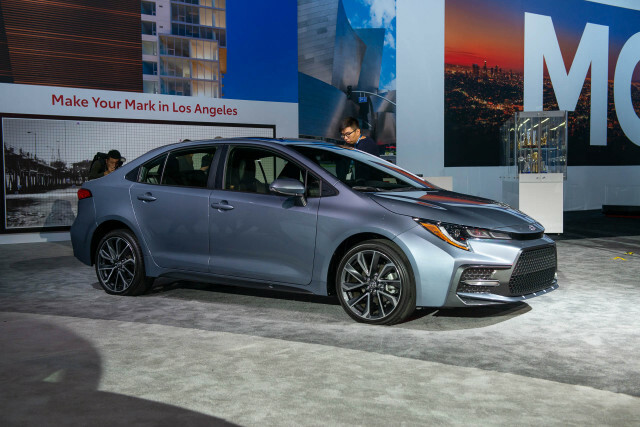 The automaker promises big improvements to its small car's noise suppression, both from better sound deadening and more careful utilization of open space in the car's structure. Mazda told The Car Connection that the 2.5-liter inline-4 will be under the hood when the redesigned 3 goes on sale early next year. The automaker said that both the automatic and manual transmissions will be offered in the U.S.
A high-compression inline-4 Mazda calls Skyactiv-X uses a special compression ignition system to burn exceptionally lean fuel mixtures in most situations to save gas, although it can switch over to conventional spark ignition for better acceleration. Early prototypes with the engine were rated at 188 horsepower, but Mazda hasn't specified figures for the new car—and it hasn't said when the new engine will hit the road in the U.S. The 3 will be available with all-wheel drive, too, which could be a boon to drivers in wintry climates.